Random House Trade Paperbacks, 9780812979275, 512pp. 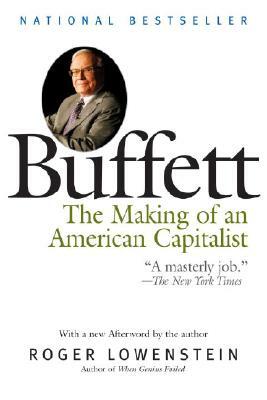 Since its hardcover publication in August of 1995, Buffett has appeared on the Wall Street Journal, New York Times, San Francisco Chronicle, Los Angeles Times, Seattle Times, Newsday and Business Week bestseller lists. Starting from scratch, simply by picking stocks and companies for investment, Warren Buffett amassed one of the epochal fortunes of the twentieth century—an astounding net worth of $10 billion, and counting. His awesome investment record has made him a cult figure popularly known for his seeming contradictions: a billionaire who has a modest lifestyle, a phenomenally successful investor who eschews the revolving-door trading of modern Wall Street, a brilliant dealmaker who cultivates a homespun aura. Journalist Roger Lowenstein draws on three years of unprecedented access to Buffett’s family, friends, and colleagues to provide the first definitive, inside account of the life and career of this American original. Buffett explains Buffett’s investment strategy—a long-term philosophy grounded in buying stock in companies that are undervalued on the market and hanging on until their worth invariably surfaces—and shows how it is a reflection of his inner self. Roger Lowenstein, author of the bestselling Buffett: The Making of an American Capitalist, reported for The Wall Street Journal for more than a decade, and wrote the Journal's stock market column, Heard on the Street, from 1989 to 1991 and the Intrinsic Value column from 1995 to 1997. He now writes a column in Smart Money magazine, and has written for the New York Times and The New Republic, among other publications. Lowenstein has three children and lives in Westfield, New Jersey.